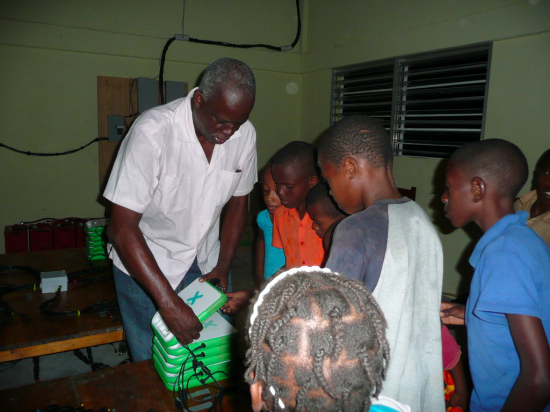 The IIT team from Chicago, Green WiFi, and the National OLPC Project Director for Haiti did it!! 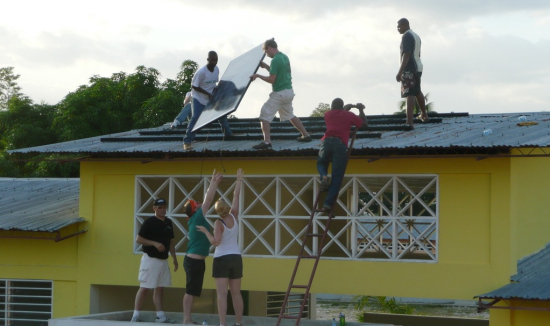 We successfully carried out our first solar photovoltaic school deployment in Haiti, last week! The EFACAP school in Lascahobas, Haiti now has 2.4KW of solar pv capability to charge 500 laptops with a DC only designed and wired system. According to our research and to OLPC, our installation has the distinction of being the world's largest single-school solar laptop charging deployment! But that was just one part of the project. Working with Fabrice Urrizalqui, a French school teacher from San Francisco, a team also set up a brand-new library at the school, full of books in French and Creole, and created an inventory and catalog, and a system for checking out the books. With the help of a team of local survey-givers, Dr, Laura Hosman from IIT carried out a baseline survey with 150 respondents, inquiring of both community members and teachers on technology and electricity use in the home, and of use of the laptops in the home and in the classroom. She and her team also talked with the teachers at the school about using the library, and about lesson plans on solar power that our team will continue to develop over the coming semester. Furthermore, we trained the local maintenance staff in how to keep up the solar system. The next step is to complete the internet connection to the school with the help of Inveneo in September 2011. Bruce Baikie is the founder of Green WiFi. Laura Hosman is assistant professor at Illinois Institute of Technology and regularly blogs about her projects in Haiti and other countries. A great project to show the world that non profit organisations can setup projects where they can give one laptop per child and on the other hand they can also produce electricity from solar panels. Other non profit organisation should look into such projects as there kind of projects have the necessary potential to change the country's future. We have had few inquiries in Nepal from groups interested in using solar energy to power XO up in the mountains where there is no electricity. I was wondering if someone could let us know the total cost of equipment used in this implementation in Haiti.